An adrenaline junkie, Adam Osmoe once went through a phase of climbing any surface that presented a challenge, whether it be rock formations in plain sight or water towers under the guise of darkness in small towns in central Illinois. Now, the Resurrection Fighting Alliance competitor hopes to climb through the ranks and become part of the RFA's well-traveled pipeline to the UFC. 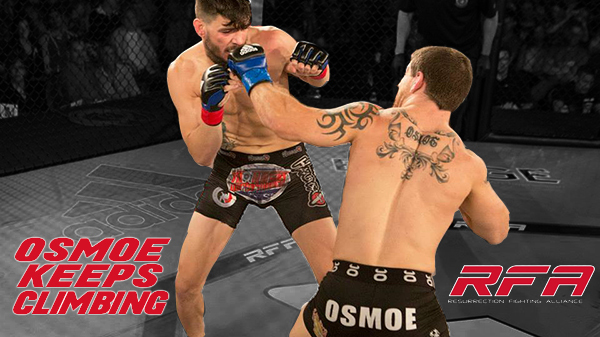 Osmoe (4-0) will step to the next rung Friday when he takes on Zach Fears (5-2) in a lightweight bout of RFA 44 at the St. Charles Convention Center. The Mount Olive native - and recent Southern Illinois University at Edwardsville graduate - will try to extend a professional career-opening win streak that last included a first-round kimura lock submission against Tyrone Paige at Cage Championships 54 Jan. 15 in Sullivan. That win came nearly a year to the day after his pro debut, a unanimous Rumble Time Promotions decision against Raymond Gray. Sandwiched within those wins, Osmoe packed in a 30-second knockout and a rally reminiscent of his mentor - Matt Hughes. In fact, Hughes was in Osmoe's corner to watch firsthand as he slammed Jimmy Donahue to break a triangle and quickly rally position for a rear-naked choke submission. To some it was eerily alike Hughes' similarly overtaking UFC foe Carlos Newton at UFC 34 - save for Newton being KO'd on the hard landing as opposed to a chokehold. While that precise moment in Osmoe's RFA debit was coincidence, other comparisons to Hughes are very much by design. The two grew up in neighboring towns and their families have long been familiar with one another. Initially, that familiarity did not push Osmoe to Hughes. A high school grappler, Osmoe used MMA fighting solely as an offseason tool to toughen up and remain fresh between seasons and stretches without matches. But when his passion for MMA outweighed that for wrestling, Osmoe had an immediate resource in Hughes that many would work years to attain. "Throughout my childhood he was really exciting to watch," Osmoe says of Hughes, a UFC hall of famer who has shaped enough of his arsenal that Osmoe himself is known in some circles as "Baby Hughes." Hughes has been part of Osmoe's core group of trainers and support staff throughout an amateur boxing win and an 8-0 amateur MMA run. That type of mentor adds pressure to the careers of some fighters: Endless questions about their relationship, comparisons and a neverending cycle among the two between matches. But Osmoe credits Hughes with easing the transition each step of his career. "He really made it a lot easier early on," Osmoe said. "I'm aware of who he is and what he's done. But it's definitely a lot more positive [factor]. Just knowing I have that tool at my disposal is always a good feeling." Among those who see bits of Hughes in Osmoe are RFA commentator and former Hughes coach Pat Miletich. In the months since his winter win against Paige, Osmoe continued working two jobs as an SIUE student prior to graduating in May with a degree in health education. Osmoe is a personal trainer who has "little downtime," but is drawn to extreme sports. From souped-up go-karts to snowboarding and water sports, "you name it," Osmoe said. "If it goes fast I've given it a try." That includes his career. Osmoe admits he has had a fast track to this point and is aware of the magnitude Friday's nationally televised fight includes on his next steps. "If you'd have asked me three years ago if I'd be here right now, I would have told you 'no,'" Osmoe said. "I've kind of dealt with it." An injury forced him off the mat temporarily, but he admits he's "been able to breathe a little bit and that's been nice." The time off helped Osmoe calibrate his mental focus and continue his personal trend of steady improvement. "I try to be the best I can every fight," he said. "I don't like coming into a fight feeling like the same fighter I was in the last fight." A big part of feeling that way, Osmoe says, is consistency within his inner circle - from Hughes and his father, Toby, who has coached him since his days in junior high school, to former wrestling teammates who have remained training partners with Osmoe throughout his career thus far. "It's hard to find good training partners," he said. "I've learned who to hold onto. And it makes me more confident knowing I'm in RFA. I'm just hoping I can come out and put on a good show for them."